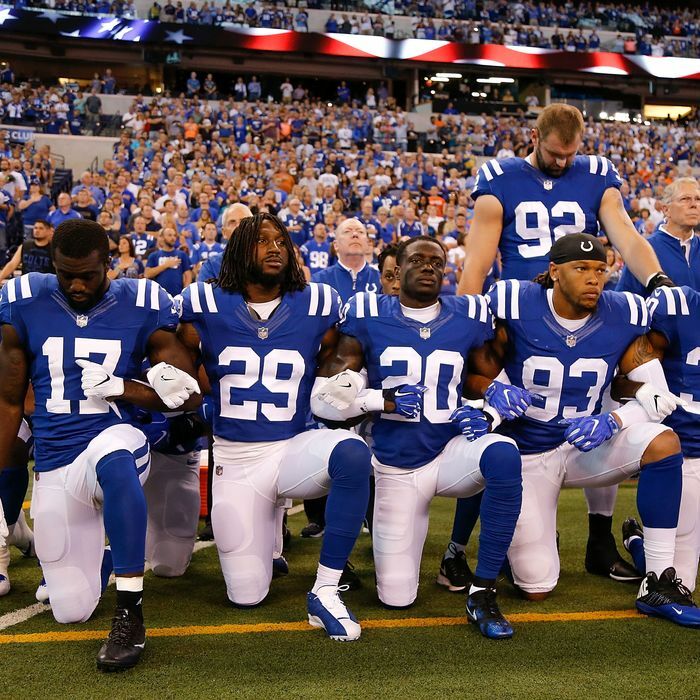 Members of the Indianapolis Colts stand and kneel for the national anthem last September. The NFL announced a new policy Wednesday that effectively bans players from kneeling during the national anthem. Adopted this week by the league’s owners, the policy is an attempt to quiet the controversy created by ignorant or intellectually dishonest observers who have misconstrued the meaning of kneeling during the anthem. Though the policy doesn’t explicitly forbid players from kneeling, it does say anyone who is on the field while the anthem is played will draw a fine for his team if he does “not stand and show respect for the flag and the Anthem.” For those who might be tempted to kneel, the NFL suggests they say in the locker room. “Personnel who choose not to stand for the anthem may stay in the locker room or in a similar location off the field until after the anthem has been performed,” the new policy says. If anyone still thinks NFL players who took a knee during the anthem were trying to disrespect the country, flag, or military, they’re willfully ignorant or lying. Colin Kaepernick, the former 49ers quarterback who sparked the protests two summers ago, has spoken often about his intention, which is to “stand up for people that are oppressed.” His former teammate Eric Reid, who joined Kaepernick in kneeling and, like Kaepernick, has sued the NFL for blackballing him, explained in the New York Times last year that they knelt specifically because it wasn’t disrespectful. The NFL Player’s Association responded to the new policy with a statement that said it was not consulted prior to its passage. It also defended those players who demonstrated. “NFL players have shown their patriotism through their social activism, their community service, in support of our military and law enforcement and yes, through their protests to raise awareness about the issues they care about,” the statement said. It added that it is reviewing the new policy to ensure that it is consistent with the collective bargaining agreement. That’s not the only question about this new policy. Another is how the league will come to define “respect for the flag and the Anthem.” Does raising a fist, as some players on the New England Patriots did last season, constitute disrespect? How about linking arms, as many teams, coaches, and even owners did last fall? Art Rooney, owner of the Pittsburgh Steelers, said both are disrespectful in his book. Another question: Will the effective ban on protesting result in jobs for Kaepernick and Reid, who are both free agents, in part because teams believed they would continue to kneel during the anthem and create a distraction? Seems unlikely.